A historical smelter stack operated from 1924 to 1972 by the Magma Copper Company is located within privately held land at the future location of the Resolution Copper Mine, operated by Resolution Copper Mining LLC (RCML). Rio Tinto has been the operator of RCML and has owned the Magma Copper Company mining property since 2004. The soil surrounding the smelter stack was characterized and evaluated in a human health risk assessment, and site-specific soil remediation levels (SSSRLs) were developed, in accordance with Arizona Administrative Code (AAC) R18-7-206, under the regulatory authority of the Arizona Department of Environmental Quality (ADEQ) Voluntary Remediation Program (VRP). The selected remedial action for the smelter-affected soil (SAS) is removal and placement of soils above the SSSRLs as a portion of the mass grading fill needed in a tailings impoundment. This action is part of the site’s permitted closure plan. Closure activities at this facility are scheduled under the permit to begin during 2016. The 1,780-acre site was divided into five land areas for evaluation, based on contaminant concentrations, topography, and accessibility. Roughly 200 soil samples were collected and analyzed, and from these data it was determined that the constituents of concern (COCs) for the SAS are arsenic, copper, and lead. The maximum observed soil concentrations of arsenic, copper, and lead were 6,990 milligrams per kilogram (mg/kg), 259,000 mg/kg, and 2,070 mg/kg, respectively. The highest observed constituent concentrations were in the Industrial Area North (IAN) and Industrial Area South (IAS) land areas, which are located closest to the stack (Figure 1), and are the focus of this case study. The three other land areas are the Silver King Wash, the Eastern Mountain Front (EMF), and the Northern Mountain Front (NMF), located to the northwest, east, and northeast of the industrial areas, respectively. Land use for the entire West Plant Site is industrial, since it will be reused for mining, and public access in all of the land areas is illegal and restricted. The conceptual site model for the SAS assessed potential risks related to exposure to SAS via ingestion, inhalation, and dermal contact for industrial workers (adults only) and illegal trespassers (adults and teenagers). An initial sensitivity analysis showed that arsenic oral bioavailability was one of the more sensitive parameters in the calculation of arsenic risk. A default arsenic bioavailability value of 40%, based on literature studies, was approved by ADEQ for use in the development of SSSRLs. RCML elected to collect site specific data to better understand the range and variability of arsenic bioavailability across the site. 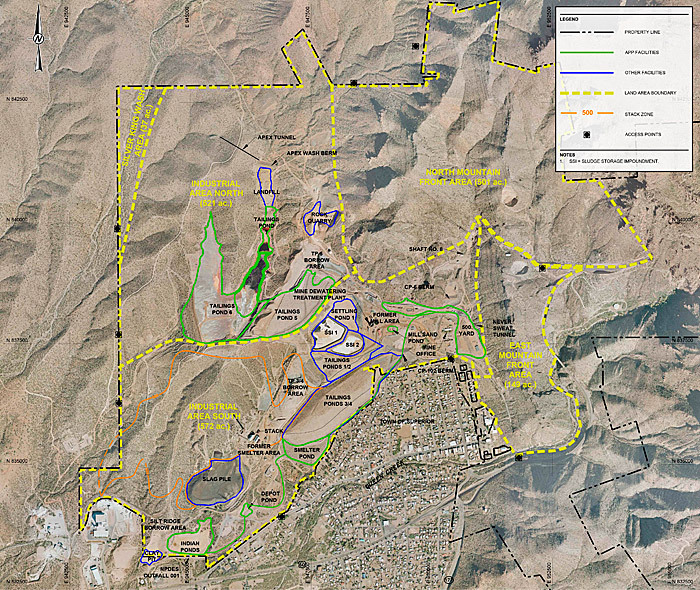 Figure 11-7 shows an overview of the West Plant site areas addressed in this case study. Figure 11‑7. West Plant site land areas. Source: Courtesy Golder and Associates. Due to the extensive time and cost associated with performing in vivo studies to measure oral bioavailability, the use of bioaccessibility was discussed with ADEQ. Bioaccessibility is an in vitro measure of the fractional dissolution of a metal from soil (or other environmental media) into a simulated gastric environment, while bioavailability is defined as an actual measure of the amount of a chemical entering systemic circulation in a living animal. Although a validated in vitro bioaccessibility (IVBA) method for lead is available (USEPA 2009c), a similar validation for arsenic IVBA results has not yet been approved by USEPA. In 2012, a final report coauthored by USEPA Region 8 and Exponent (Griffin and Lowney 2012) provided a rigorous evaluation of the available bioaccessibility and bioavailability data for arsenic and summarized arsenic IVBA for soils and sediments from 20 swine-fed and 17 monkey-fed soil studies. USEPA approval of a final model correlating arsenic bioaccessibility and bioavailability is pending further study and review by USEPA’s Technical Review Workgroup (TRW). Despite the pending status for the arsenic IVBA, RCML determined that site-specific arsenic IVBA data would aid in understanding the general range of arsenic bioaccessibility at the site, and may be used to estimate oral bioavailability once the final USEPA approved model is published. A total of 26 surface soil samples were collected throughout the site for the bioaccessibility evaluation, with 6 samples collected in the IAN and 10 collected in the IAS. The samples were chosen from areas of known arsenic concentrations to provide information on bioaccessibility across the range of observed arsenic concentrations. The samples were analyzed by the EMPA Plus Laboratory at the University of Colorado using the relative bioavailability leaching procedure method (RBALP). Electron microprobe analyses (EMPA) were conducted on a selection of the soil samples that underwent IVBA by the EMPA Plus laboratory for additional evidence to establish the types of arsenic mineral phases occurring in site soils. The IVBA results throughout the West Plant Site were variable, with values ranging between 13% and 75%. The IVBA and the EMPA results for the IAN area suggest that the soil in this area received less smelter emissions relative to the IAS. 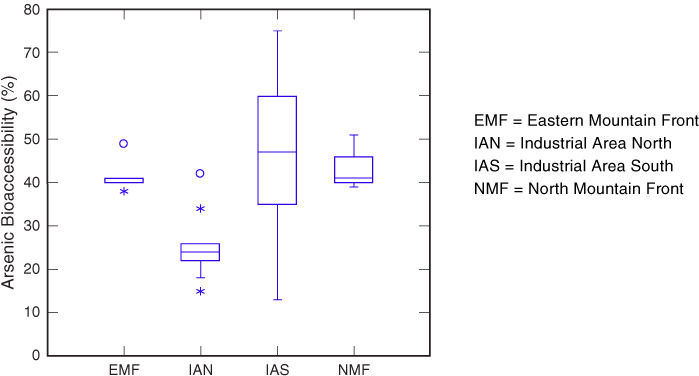 This finding is consistent with the predominant wind patterns (since the IAN area is crosswind and further from the stack, whereas the IAS includes areas immediately surrounding and downwind of the stack) and with the observation that arsenic concentrations are lower in the IAN relative to the IAS. Figure 11‑8. Boxplots of IBA data per land area. IAN (24%) is distinctly lower than the other land areas (ranging between 39% and 48%), and the upper quartile value in the IAN (26%) is lower than the lower quartiles for the other land areas (the lowest of which is 35%). EMPA results support the observation of distinctly different arsenic data in the IAN. The highest percentage of arsenic/metal oxides (AsMO) and manganese oxy-hydroxides (MnOOH) occurred in the IAN samples, while there was an absence of AsMO and MnOOH in the IAS samples. These mineral phases are negatively correlated with arsenic IVBA, indicating arsenic is less available to be liberated from these mineral species. Arsenic-containing enargite and pyrite, normally nonsmelting byproducts, are present in the IAN, and not found in any other areas. In the IAS, EMPA results show that the mineral phases are predominantly comprised of dross and copper metal oxides (CuMO), which are the mineral phases with the two highest positive correlations to arsenic IVBA. AsMO phases and MnOOH (with negative correlation to arsenic IVBA) are absent from the IAN samples. The data from the IVBA study was used to construct a probability distribution for oral bioaccessibility of arsenic at the West Plant Site for use in the probabilistic calculations of SSSRLs. The raw IVBA data were used in the distribution because at the time of the calculations, the USEPA had not yet validated the model for arsenic IVBA. Ideally, the IVBA results are run through a validated model that has been calibrated to in vivo animal soil ingestion bioavailability studies to facilitate estimating the site-specific RBA. 11.4.4 How Did Bioavailability Results Affect Site Decisions? The Arizona VRP has deferred approval of the site-specific IVBA data pending validation of the arsenic IVBA method by the USEPA. However, the collection and evaluation of arsenic IVBA data had a positive result in the remedial action design in that the arsenic in the IAN and IAS were determined to be derived from distinct populations related to mineralogy. The IAS remedial activities could begin immediately upon approval of SSSRLs, allowing placement of the needed mass grading fill for permitted closure activities at the tailings impoundment. The remedial activities at the IAN are deferred, for now, pending validation of IVBA methods by the TRW, or further advancement of arsenic bioaccessibility methodology. The use of IVBA data in the IAN, if validated, may result in a reduced footprint for remedial activities, to be determined by the final validated and approved IVBA value. The separation of the IAN from the IAS, based on the results of this study, provided resolution of schedule conflicts by allowing remediation of the IAS in a timely manner.